A lawyer (Robert Taylor) working for a Chicago gangster (Lee J. Cobb) falls in love with a showgirl (Cyd Charisse) and tries to leave the mob; but he soon finds that this isn’t as easy as he thought. 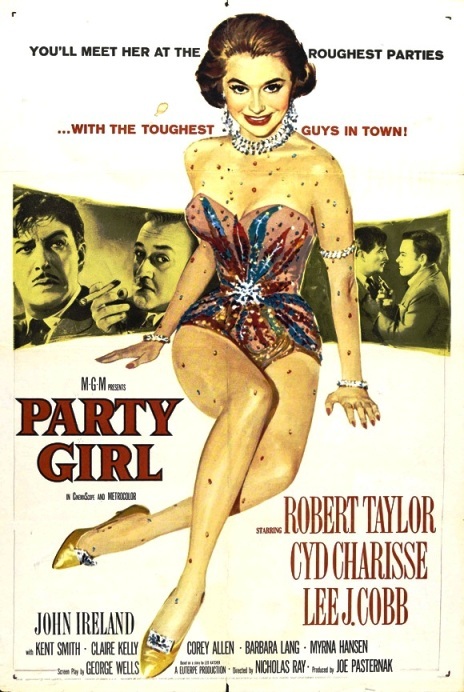 Party Girl is a disappointing entry in Nicholas Ray’s otherwise impressive oeuvre. Despite high production values, fine performances by the leads (especially Cobb), a couple of fun dance numbers by Charisse, and occasional moments of directorial ingenuity, the film is ultimately hampered by an uninteresting script which covers material trodden many times over. Taylor’s character (a savvy, successful lawyer) should know better than to assume he can simply leave his life with the mob behind him; and when things go wrong for both him and his new love (Charisse), it’s hard to feel either much compassion or curiosity about what will happen next. No. Although Ray does a competent job with the material he’s given, this is not among his best work. While I agree with most of the points in the assessment – pros and cons – I’m gonna have to see this as a must. It’s very easy to consider this one of director Ray’s ‘for hire’ assignments. Perhaps the fact that the material is not particularly original is the very reason he was brought on board – to put a much-needed stamp on things. Which I feel Ray does. Somehow he managed to breathe life and subtlety into very familiar territory. In doing so, he was aided by a very able cast (all turning in solid work) and top-notch production/costume design. I’m taken with the aspect that this is a more low-key mob story. As such, a few of the more surprising moments carry an interesting punch. And then there’s Ms. Charisse – (who has just left us) – who is a personal fave. This is my idea of a diva! For someone who never set out to be a top-drawer dramatic actress, she acquits herself nicely here. And her two dance numbers are reason enough for a viewing. Not being one who’s overwhelmingly big on dance in film, I’d have to say Cyd is in the top five of those whose moves leave me awestruck. When I watch her dance, it very much makes sense to me. As well, Ray is among my favorite directors, so of course I’ll go to bat for this one. It’s not like it’s a misfire. Admittedly, overall, it’s a minor film, but it’s hardly a dull one.